No instrument, reagent, soſtware or system carries the Werfen name unless it meets our exceptional standards. We proudly put quality before everything else, and always will. Quality is our utmost priority. We always go the extra mile to reach the highest quality standards— across all business lines and geographical areas, making sure we deliver only the best. 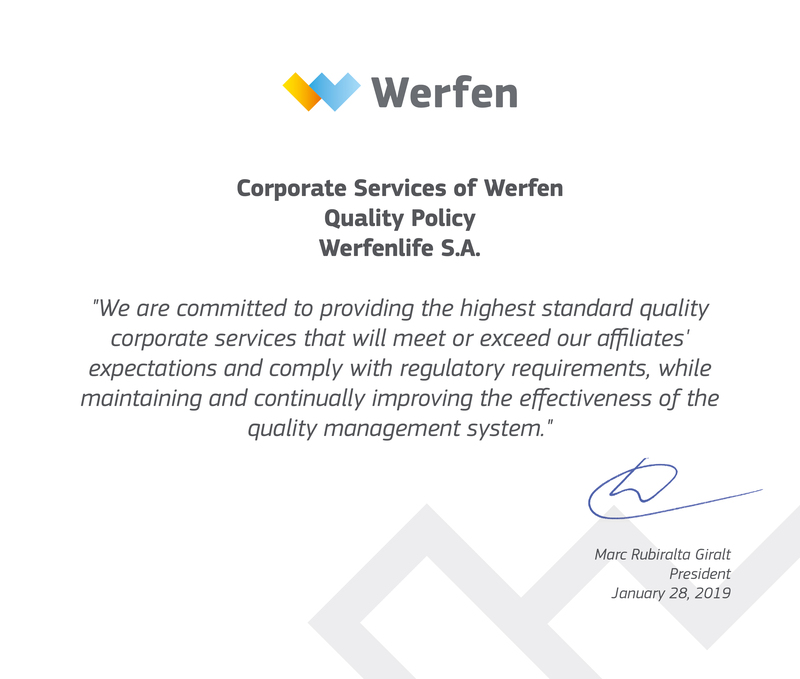 Werfen has 50 ISO certificates which are an indication of our constant commitment to quality, sustainability, and our customers. We are committed to delivering products and services that meet the highest standards of our customers. We guarantee that customers receive services that exceed their expectations. We always stay up-to-date in order to to create state-of-the-art solutions. We ensure optimal service, that includes operator training, systems support, and a helpline services for on-demand support. We protect and grow employee satisfaction through continued education, and professional development. We contribute to the improvement of patient care and quality of life through clinical laboratory advancements. ISO certificates are issued by the International Organization for Standardization (ISO) and their purpose is to ensure the safety, reliability and quality of products and services. Ensures that the organization provides products and services that consistently meet customer and regulatory requirements, and that the organization consistently aims to enhance customer satisfaction. Ensures that the organization provides medical devices and related services that consistently meet customer and regulatory requirements. All Werfen manufacturing sites are certified with this standard. Ensures that the organization strives to manage its environmental responsibilities in a systematic manner and in compliance with international and local environmental regulations. It ensures that the organization safeguards the security of assets such as financial information, intellectual property, employee details or information entrusted to you by third parties. Commercializing products with the highest quality, which employ the latest technology. Ensuring that the needs of our clients are always met, and legal and regulatory requirements are fulfilled. Always keeping abreast of advances in technology in order to offer state-of-the-art solutions to our customers. Offering efficient and customized post-sales services such as ongoing user training, specialized technical services, and a helpline for inquiries or equipment repairs. Promoting a positive work environment at Werfen. Improving the quality of life of patients through innovation. Encouraging the organization to live by these quality objectives.